Japan's Akatsuki is a spacecraft that is orbiting Venus to study the planet's climate and atmosphere. The $300-million spacecraft began its science observations in 2016 and remained operational as of late 2017. During its mission, the spacecraft has made some unexpected observations. Akatsuki — the name means "dawn" in Japanese — had a rocky start. Its first attempt to go into orbit around Venus in 2010 failed. However, a second try in 2015 was successful, and allowed investigators to do some of the science they had originally planned for the planet. However, two infrared cameras were disabled in December 2016 due to unstable power consumption. Japan has enjoyed several successes in three decades of space exploration, first with the Institute of Space and Astronautical Science (ISAS) and later with the Japanese Aerospace Exploration Agency (JAXA). ISAS was previously its own agency, but became a division of JAXA in 2003). Under ISAS, two probes, the Suisei and the Sagigake, flew by Halley's Comet in 1986. The two spacecraft were targeted to fly by other comets as well, but the missions did not complete either because of lack of fuel (Suisei) or lost contact (Sakigake). Under JAXA, the Hayabusa mission, from 2005 to 2010, returned samples from an asteroid, 25143 Itokawa. JAXA also flew the Ikaros solar sail testing mission successfully in 2010, as well as Kaguya, a mission to the moon, from 2007 to 2009. Hayabusa 2 launched in 2014. Its mission is to return samples from another asteroid, 162173 Ryugu. The spacecraft is expected to arrive in 2018. The only other Japanese planetary mission flown to date is Nozomi, which was supposed to go into orbit around Mars in 2004. The spacecraft failed to achieve orbit and did a flyby instead. However, JAXA is a partner with the European Space Agency on the BepiColombo mission, which is expected to launch in 2018 for Mercury. JAXA's contribution to the mission is the Mercury Magnetospheric Orbiter, which will study the atmosphere, planetary magnetic field, solar wind and dust. In crewed spaceflight, Mamoru Mohri was the first Japanese astronaut to fly in 1992, aboard the U.S. space shuttle Endeavour for mission STS-47. JAXA has an active astronaut corps and has flown approximately 20 missions to date. Since 2011, Japanese astronauts have done long-term missions aboard the International Space Station approximately once per year. Akatsuki, also known as Venus Climate Orbiter and Planet-C, launched from Japan's Tanegashima Space Center on May 20, 2010, a few days after its scheduled departure due to a weather delay. (The solar sailing mission Ikaros rode along on the same rocket.) On Dec. 7 of that year, Akatuski's main engine fired to start orbital insertion around Venus. The main engine only fired for three minutes, far less than the 12 minutes needed to achieve orbit. Officials were concerned when comparing Akatsuki to the failure of Nozomi, their only other planetary mission, just seven years before. "Our score is zero wins, two losses," Takehiko Satoh, of the Japan Aerospace Exploration Agency (JAXA), told Space.com at the 2010 fall meeting of the American Geophysical Union. "We have to be more conservative to plan our next planetary mission, so it will never fail in any aspect." JAXA launched an investigation and concluded the engine likely shut off due to salt deposits in a check valve, which prevented fuel from circulating in the orbital maneuvering engine. The combustion chamber was also damaged because the deposits made the combustion more oxidizer-rich. To buy time and save power, JAXA put the spacecraft into hibernation while figuring out a recovery plan. Managers decided to use smaller attitude thrusters to attempt another orbital insertion around Venus, rather than attempting another use of the damaged main engine. While the thrusters' weaker power wouldn't place Akatsuki in the planned orbit, the spacecraft could still do science from its modified trajectory. 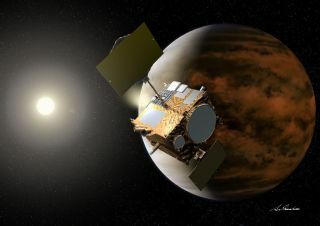 Akatsuki drifted in an orbit around the sun for five years, until it got close enough to Venus in 2015 to attempt another orbital insertion at the planet. On Dec. 6 – coincidentally, five years to the day after the last attempt – Akatsuki fired its attitude-control thrusters for 20 minutes and made it successfully into orbit. The new plan inserted Akatsuki into a 13-day orbit with a maximum distance (apoapsis) of 273,000 miles (440,000 kilometers) from the surface of Venus. After some engine burns, the expected science orbit was a nine-day orbit with an apoapsis of 193,000 miles (310,000 kilometers). By comparison, the original plan in 2010 was to put Akatsuki into a 30-hour orbit with an apoapsis almost four times closer, or 50,000 miles (80,000 kilometers). Japan's Akatsuki spacecraft captured this image of Venus after its attitude control engine thrust ejection on Dec. 7, 2015, at a distance of 45,000 miles (72,000 km) from Venus. The main goal of Akatsuki is to understand more about the climate of Venus. Venus is often described as a hellish planet because its surface temperatures are hot enough to melt lead, and the few Soviet Venera spacecraft that landed there in the 1970s and 1980s only survived minutes on the surface due to the extreme pressure and heat. The planet is volcanically active with a thick carbon dioxide atmosphere. While many spacecraft have flown by Venus, it has only been visited long term by a few orbiters, such as multiple Venera spacecraft (Soviet Union, 1970s and 1980s), NASA's Pioneer Venus 1 (1978-1992), NASA's Magellan (1989-1994), and the European Space Agency's Venus Express (2005-2015). Akatsuki was expected to observe Venus in wavelengths ranging from ultraviolet to long-wave infrared, through its six instruments. These included an ultraviolet imager, a 1-micrometer camera, a 2-micrometer camera, a long-wave infrared camera, a lightning and airglow camera, and an ultra-stable oscillator. (The latter instrument is used to look at radio waves between Akatsuki and Earth as they pass through the Venusian atmosphere, revealing information about temperature and sulphuric acid vapor.) However, the 1-µm camera and 2-µm camera were put offline in late 2016 due to unstable power consumption. "Akatsuki takes advantage of the six instruments to observe meteorological phenomena on Venus in detail," ISAS said in a statement. "These findings are expected to lead to a better understanding of meteorological phenomena not only on Venus, but also on other planets and further help explicate why the Earth's atmosphere is the way it is, as well as how it may change in the future." In May 2016, Akatsuki data helped produce a ghostly movie of Venus' night side, as seen in infrared wavelengths. JAXA observed that in just four hours, the super-rotating clouds captured on camera moved by about 10 degrees. "Deformation, appearance and disappearance of clouds are obvious in this movie," JAXA said. In 2017, scientists released puzzling data showing a large stationary wave in the upper atmosphere of Venus, where clouds usually whip along at 100 meters (328 feet) a second. A related study in Nature suggested the wave might be due to atmospheric flow over a mountain, similar to how "gravity waves" are produced on Earth. Later that year, Akatsuki scientists uncovered data suggesting varying wind speeds at the equator at altitudes of between 45 and 60 kilometers (28 and 37 miles). Previous studies suggested the wind speed is uniform at this altitude. "Venus' whole atmosphere is rotating much faster than the surface below at the altitude of the cloud top (70 km), a unique situation called super-rotation," JAXA stated at the time. "Its mechanism is still largely unclear."